A few months ago I have posted an article about Amazon Web Services Redshift – Amazon’s Data Warehouse solution in the cloud. 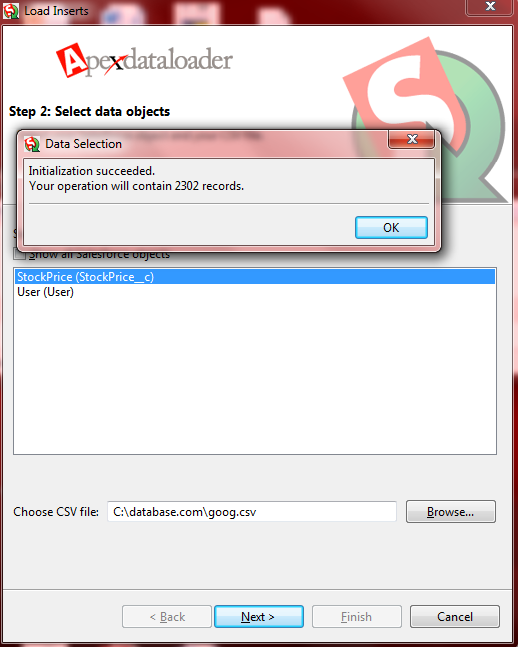 XtremeData dbX is a similar massive parallel SQL database engine that can be run on-premise as well as in the cloud. 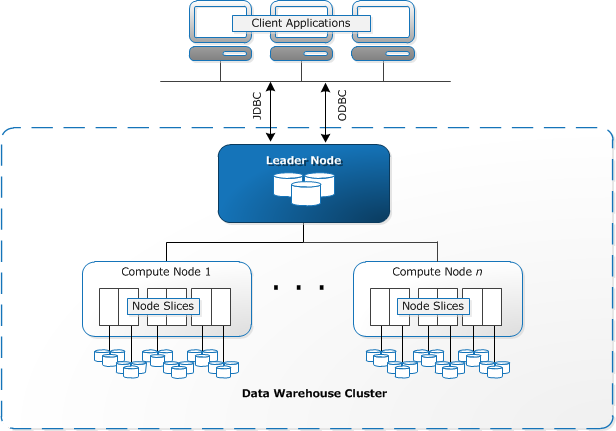 It is a purpose-built high-performance and scalable solution for data warehouse applications and large scale analytics using innovative technologies such as vector execution model, dynamic data distribution and automatic load balancing. XtremeData dbX is a full SQL and ACID compliant database engine based on shared-nothing, massive parallel query execution. The underlying technology relies on PostgreSQL (similarly to AWS Redshift). In essence, the key architecture components are the head node and multiple data nodes – this is a fairly common patterns in massive parallel execution scenarios. 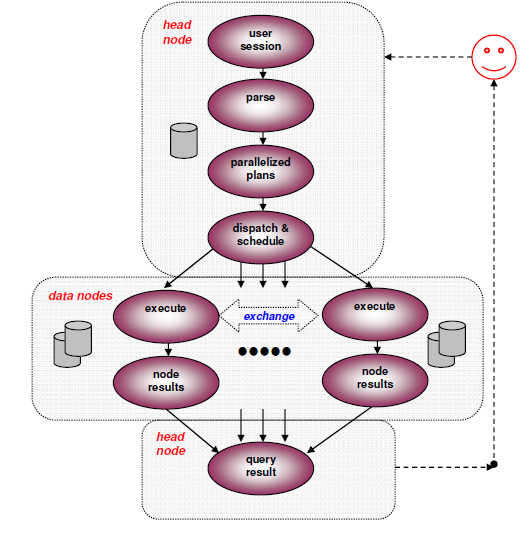 The head node manages the client connections, parses and plans the queries and sends the result back to the clients. The data nodes manage data storage and execute queries. 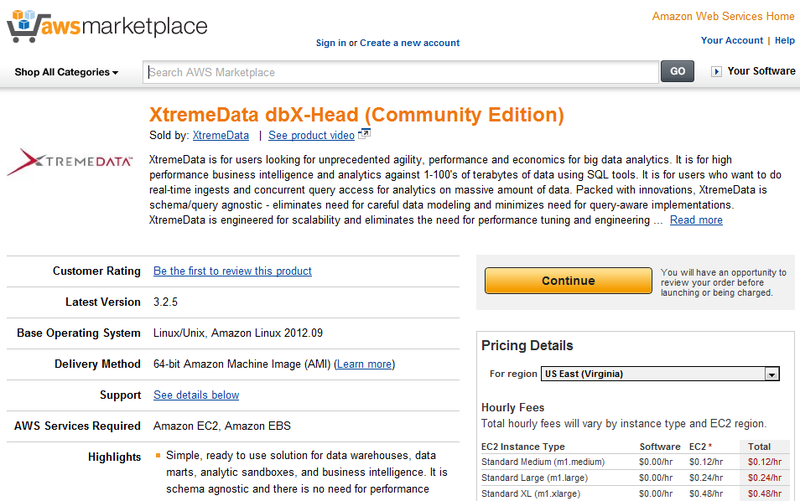 Besides the on-premise deployment option, XtremeData dbX is available in AWS cloud. We need to go to AWS Marketplace to register for it.There are different editions; one for dbX Head and another for dbX Data nodes. 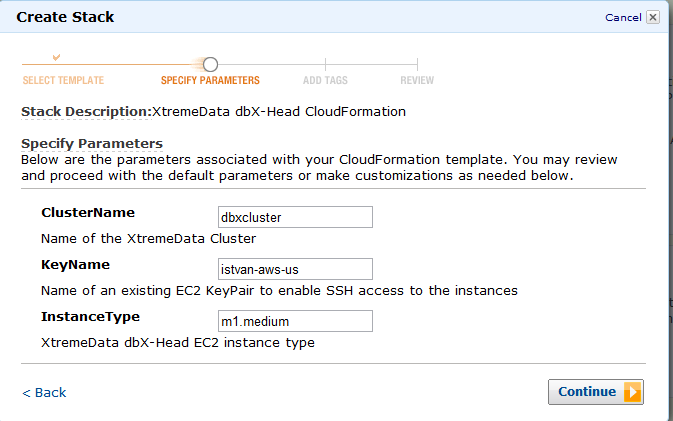 XtremeData provides a document how to setup dbX head and data nodes in the AWS cloud but I decided to implement AWS CloudFormation templates to make the deployment easier. Since there are two different AMIs for head and data nodes, I created two templates. "ConstraintDescription" : "can contain only alphanumeric characters, spaces, dashes and underscores." "ConstraintDescription" : "must be a valid EC2 instance type." This will create the security group for dbX node communications, define userdata (cluster name) and allocate 4 EBS volumes (100 GB each) to dbX Head node. This template uses cluster name and AWS EC2 hostname concatenated with ; for userdata, it also uses the availability zones for dbX Head node and the security group that we just defined for dbX Head node. In addition, it allows to define the number of data nodes – it will be used to configure an auto-scaling group to ensure that we have the requested amount of data instances running. CAUTION: Please, note that it is not enough just to terminate the nodes if you have auto-scaling defined since AWS will initiate new nodes. We need to terminate the instances using as-terminate-instance-in-auto-scaling-group command and then delete the auto-scaling config with as-delete-auto-scaling-group and as-delete-launch-config. More information about AWS auto-scaling can be found here. Once we submit the configuration, the status will become CREATE_IN_PROGRESS and then after a while CREATE_COMPLETE. 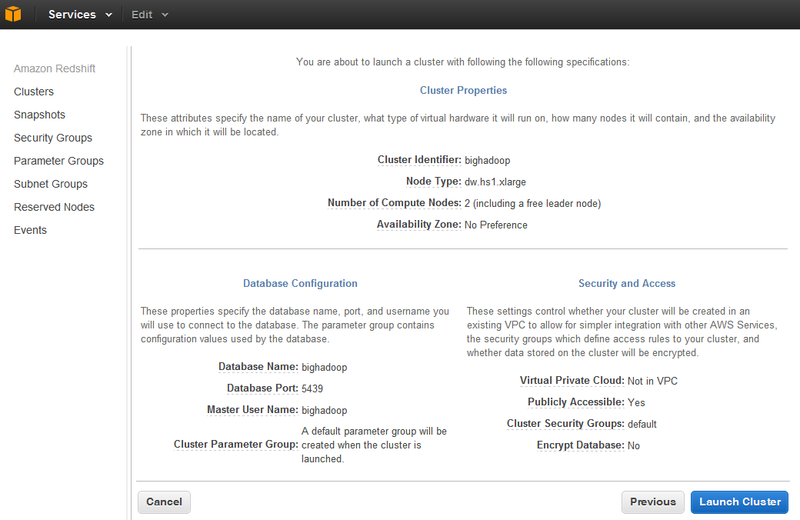 Once we have fired up the nodes, we can login to the head node as ec2-user using ssh (or e.g. putty on Windows). Now we can login as dbxdba user (we can do it again with ssh or putty since the key is copied over from ec2-user). 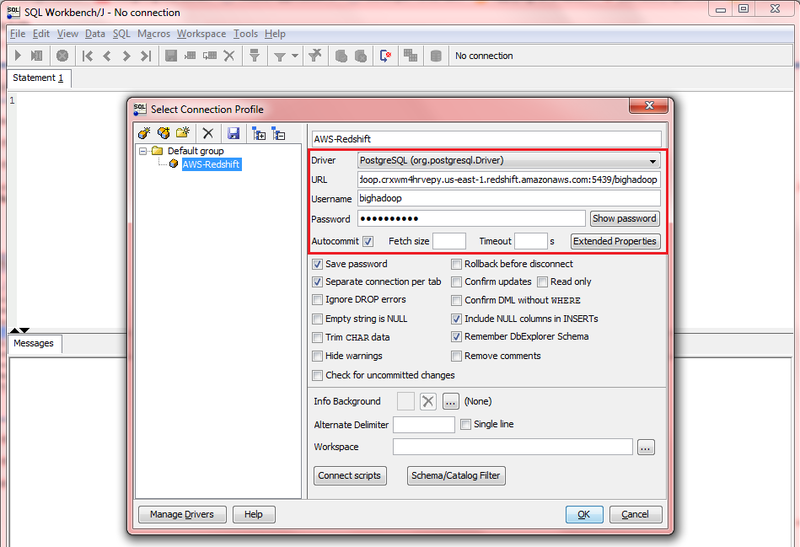 Then we need to change the dbxdba password (using passwd Linux commad) in order to be able to login using dbX tools. Now we can create a table, insert some rows and run select statements. Welcome to dbX psql 3.2.5, the interactive SQL terminal. WIth the help of the xdudb command line tool we can check dbX version, check disk usage and mounted filesystems, etc. 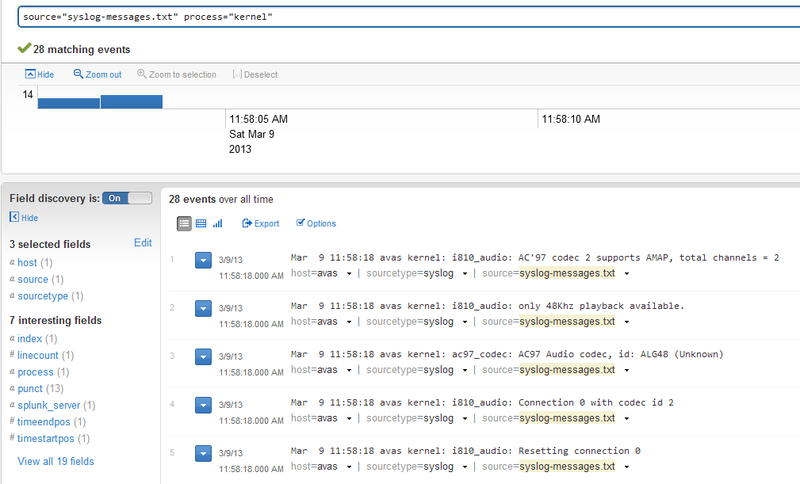 Splunk is a platform to process machine data from various sources such as weblogs, syslogs, log4j logs and can also work with JSON and CSV file formats thus any application that produces JSON or CSV output can be seen as a source for Splunk. As the volume and variety of machine data are increasing, Splunk is becoming a more and more interesting player in big data world, too. Splunk can be considered as a search engine for IT data. Splunk collects data from multiple sources, indexes them and the users can search them using Splunk proprietary language called SPL (Search Processing Language). The search results can then be used to create reports and dashboards to visualize the data. – forwarders are used to forward data to Splunk receiver instances. Receiver instances are normally indexers. – indexers that are splunk instances to index data. Indexes are stored in files. There are two types of files; raw datafiles which store the data in compressed format and index files that contain metadata for search queries. During indexing, Splunk extracts default fields and identifies events based on timestamps or creates them if there is no timestamp found. – search head and search peers. In a distributed environment search head manages the search requests, directs them to search peers and then merges result back to the users. – Splunk Web is a graphical user interface based on Python application server. Splunk Storm is a cloud service version of Splunk. 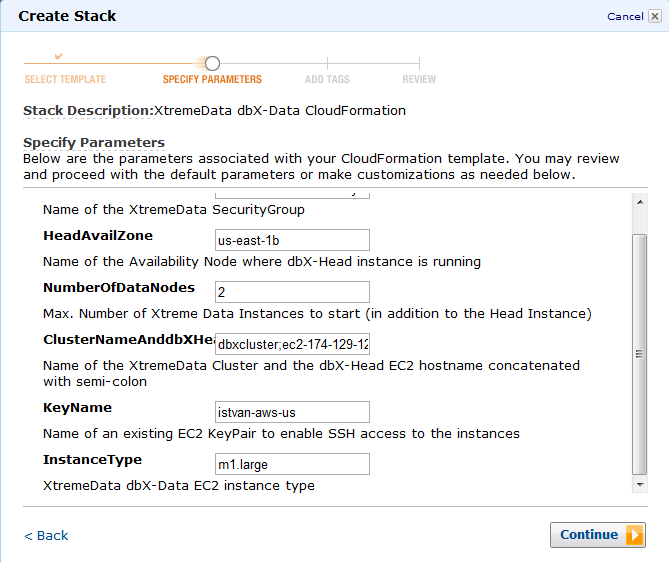 Splunk Storm runs in the Amazon cloud and uses of both Elastic Block Storage (EBS) and the Simple Storage Service (S3). The price plan is based on monthly fee, it depends on the volume of the data that you want to store. As of writing this article, there is a free tier with 1 GB storage, while for example 100 GB storage volume costs 400 USD and the maximum 1 TB storage volume costs 3,000 USD per month. To get started, we need to sign up and crate a project. 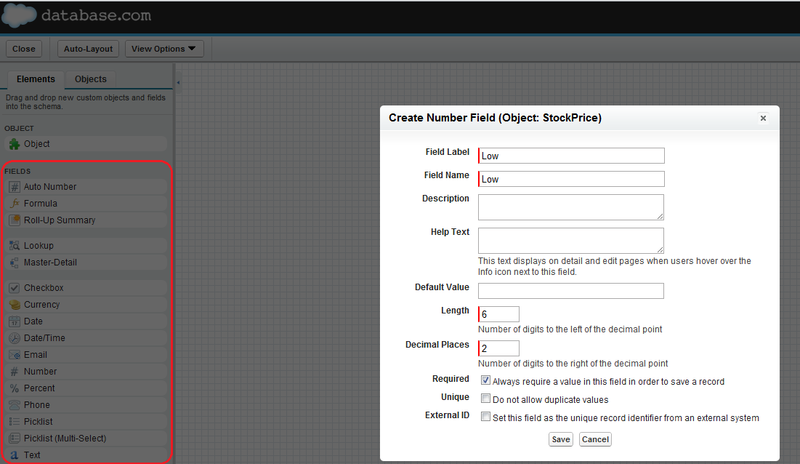 Then we can define the data inputs. There are four options: upload a file, use forwarders, use the API (it is in beta yet) or use network data sent directly from the servers. It takes a some time to index the files and then they become available for search queries. "source="access_log.txt" status>="400" AND status <="500"
As a next example, we want to test output generated by our program using Twitter API. The program will generate JSON format in a file using Python based Twitter API. The directory is monitored by a Splunk forwarder and once the file is created in the predefined directory, the forwarder will send it to Splunk Storm. 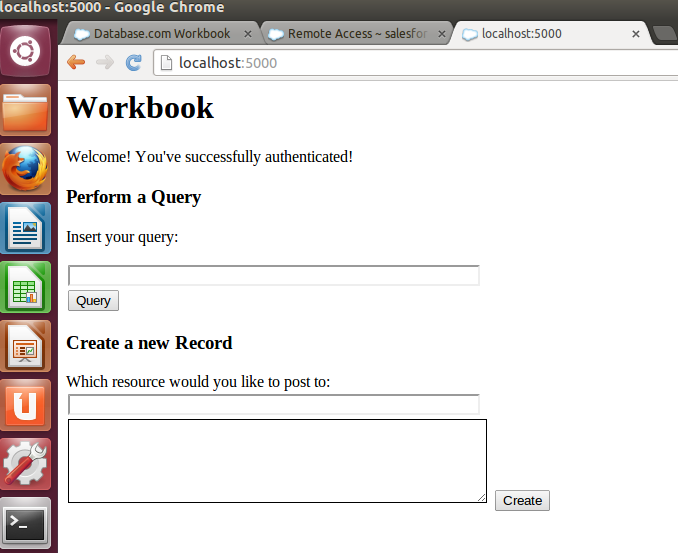 First we need to create an application in Twitter via https://dev/twitter.com portal. The application will have its customer_key, customer_secret, access_token_key and access_token_secret that is going to be required by the Twitter API. The Twitter API that we are going to use for the Python application is downloadable from Github, https://github.com/bear/python-twitter.git . 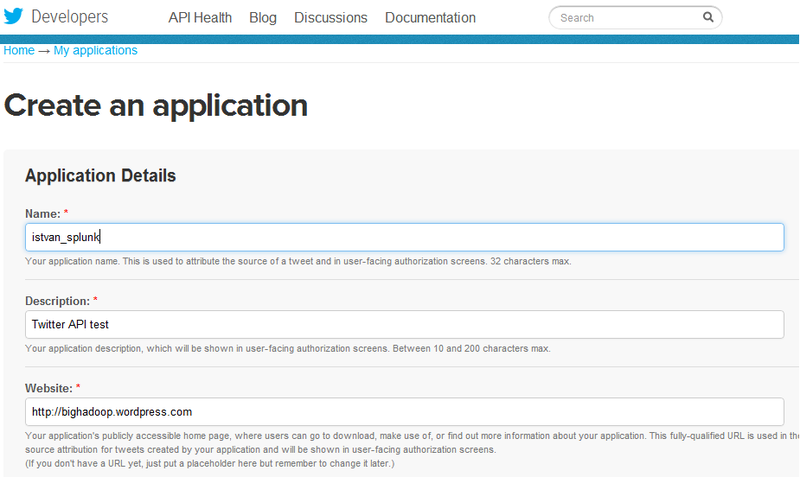 This API depends oauth2, simplejson and httplib2 so we need to installed them first. Then we can get the code from Github and build and install the package. print "Usage: " + sys.argv + " keyword count"
Then we need to install Splunk forwarder, see http://www.splunk.com/download/universalforwarder . 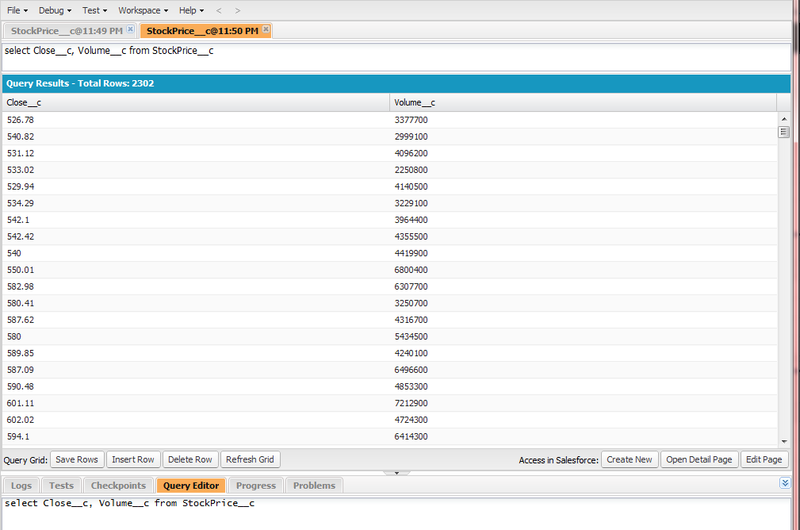 We also need to download the Splunk credentials that will allow the forwarder to send data to our project. Once the forwarder and the ceredentials are installed we can login and add a directory (twitter_status) for our forwarder to be monitored. We defined the sourcetype as json_notimestamp. The program creates a twitter_status.txt file under twitter_status directory which is monitored by Splunk forwarder. The forwarder sends the output file to Splunk Storm. After some time it will appears under the inputs sections as authenticated forwarder. The file will be shown as a source together with the previously uploaded apache access log and syslog. We can also define a search query to show the top 10 timezones from the Twitter result and from the search result it is easy to create a Report with just a few clicks on the web user interface. 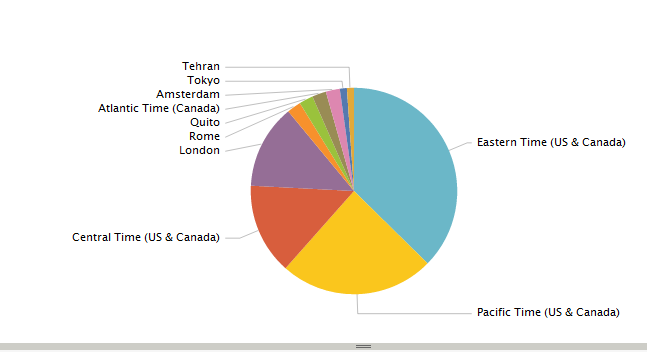 The report allows to chose multiple visualization options like column, area or pie chart types, etc. As mentioned in the beginning of this article, the variety and the volume generated by machines are increasing dramatically; sensor data, application logs, web access logs, syslogs, database and filesystem audit logs are just a few examples of the potential data sources that require attention but can pose difficulties to process and analyse them in a timely manner. Splunk is a great tool to deal with the ever increasing data volume and with Splunk Storm users can start analysing their data in the cloud without hassle. Traditional relational databases are built upon a synchronous, client-server architecture that is often limited in terms of scalability requirements that are posed by distributed computing systems. As a result, various sharding, caching, and replication techniques emerged to cope with these demands. On the other hand, NoSQL solutions have emerged on the ground of the CAP theorem. Data management systems like BigTable, HBase, MongoDB, Cassandra, and Dynamo offer different capabilities depending on how they balance consistency, availability, and partition tolerance. However, they gave up supporting SQL and ACID properties, which are critical in the relational database world. NuoDB is a complete re-think of relational databases that is built on a new foundation; partial, on-demand replication. Under the hood, NuoDB is an asynchronous, decentralized, peer-to-peer database. It uses the concept of Atoms, these are objects that are being replicated . 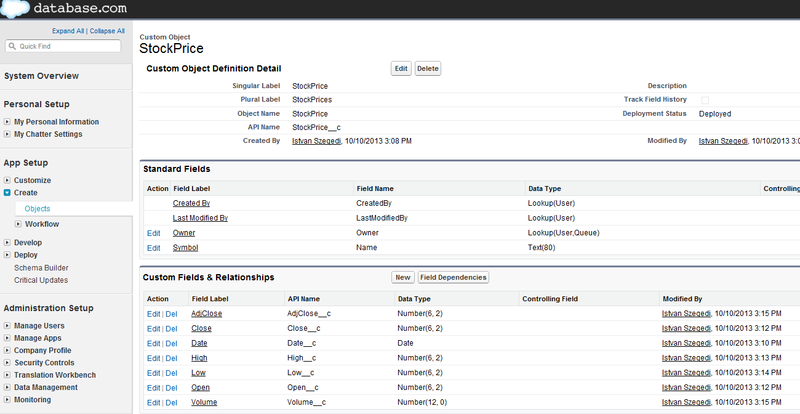 In NuoDB everything is an Atom; database, schema, sequence, table, index, records, blobs, data are all Atoms. NuoDB holds a patent on this peer-to-peer object replication. NuoDB architecture has three layers: management layer, SQL layer and data layer. The management layer is comprised of an agent that manages the NuoDB processes running on a particular computer, it starts and stops them and it also collects statistics from the transaction and storage engines. Certain agents are configured to be a broker – brokers communicate with the client initially and then the broker introduces the client to the transaction engine. From then on the client can communicate directly with the transaction engines. NuoDB management layer also offers a command line and a web-based management tool to manage the databases. 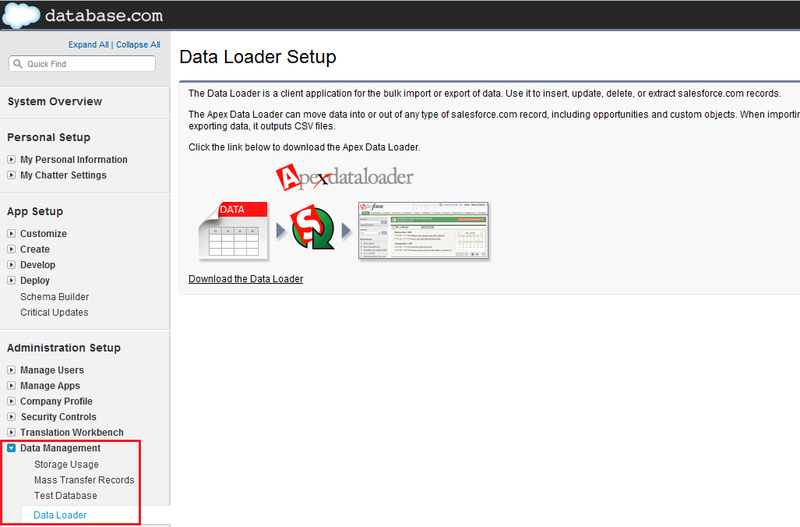 NuoDB also offer a command line loader for exporting and importing data. At the SQL layer NuoDB has transaction engines that provide access to a single database.The transaction engine parses, compiles, optimizes and executes the SQL statements on behalf of the clients. At the data layer NuoDB has storage managers that provide persistence of the data. A storage manager uses key/value pairs to store the information but it can also use more sophisticated stores e.g. HDFS. In case of a minimal configuration we can run every components (broker, transaction engine and storage manager) on the same machine. NuoDB can be easily scaled out and can be made redundant by adding multiple brokers, transaction engines and storage managers. In more complex scenarios we can run NuoDB in the AWS cloud or across multiple corporate datacenters providing geo-redundancy. 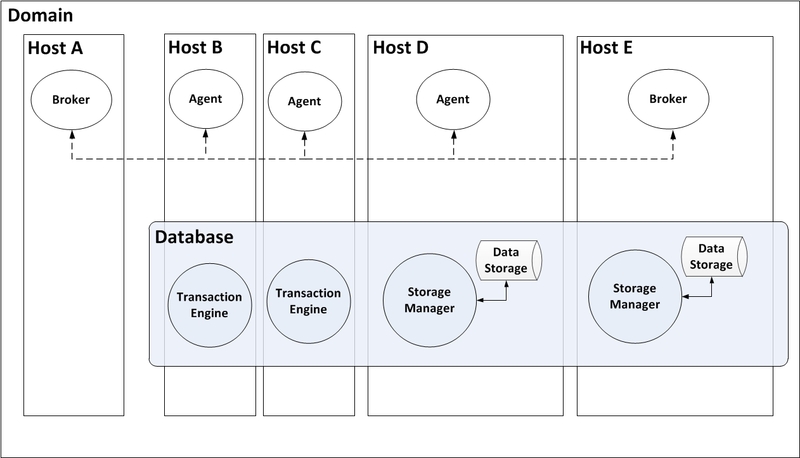 Below is an example of a redundant architecture with two brokers, two transaction engines and two storage managers. NuoDB is available on multiple platforms like Windows 32 and 64-bit, Linux 64-bit (Ubuntu, RHEL, Suse), Mac OSX 10.7, Solaris 11 (Inter 64-bit). For this article we used a Ubuntu 12.04 LTS virtual machine. First we need to start up the components as discussed above; the broker/agent, then from the command line management tool we can start up the transaction engine and the storage manager. We also need to configure the properties file to contain the settings for the domain. Note, that we started the storage manager with initialize yes option. This is only for the first time, any subsequent startup shall use initialize no option, otherwise the data will be overwritten. NuoDB supports various programming languages for client applications such as Java, .NET, PHP, Ruby and Node.js. In this section we demonstrate that NuoDB supports JDBC in the same way that it is available for traditional relational databases. The Java program needs to add nuodbjdbc.jar to its classpath. * Gets the name for the given id, or null if no name exists. Amazon Web Services has made publicly available its fully managed, petabyte-scale data warehouse cloud service in February, 2013. It promises a high performance, secure, easily scalable data warehouse solution that costs 1/10th of a traditional data warehouse (less than 1,000 USD/TB/year, according to the AWS Introduction to Redshift presentation: http://aws.amazon.com/redshift/) , it is compatible with the traditional BI tools and ready to be running within minutes. As of writing this article the service is available in US East region only but supposed to be rolled out to other regions, too. The service is manageable via the regular AWS tools: AWS management console, command line tools (aws commands based on python) and API based on HTTP requests/responses. The easiest way to launch a cluster is via AWS console. Then we need to select the node type (XL or 8XL) and the number of compute nodes. A cluster can be single or multi-node, the minimum config is a one XL node cluster, while the maximum config is sixteen 8XL nodes – you can do the math in terms of cores, memory and storage. The status will be first “creating” for a while then it will become “available”. 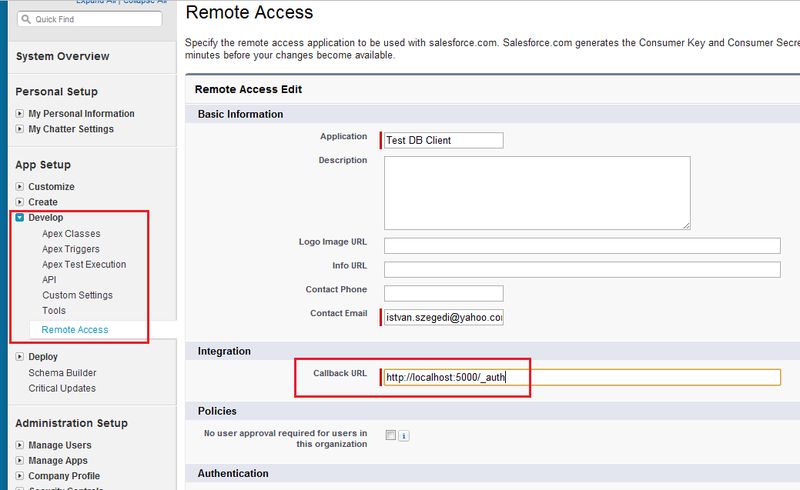 This is when the JDBC url will become known and can be used for configuring the clients. In order to make the service accessible, we need to configure the security options (either a security group – if Redshift is going to be accessed from EC2 – or a CIDR/IP (Classless- Inter-Domain Routing IP range) – if Redshift is to be accessed from public Internet. The system will automatically recognise the IP address of the client connected to AWS console. And that is it! 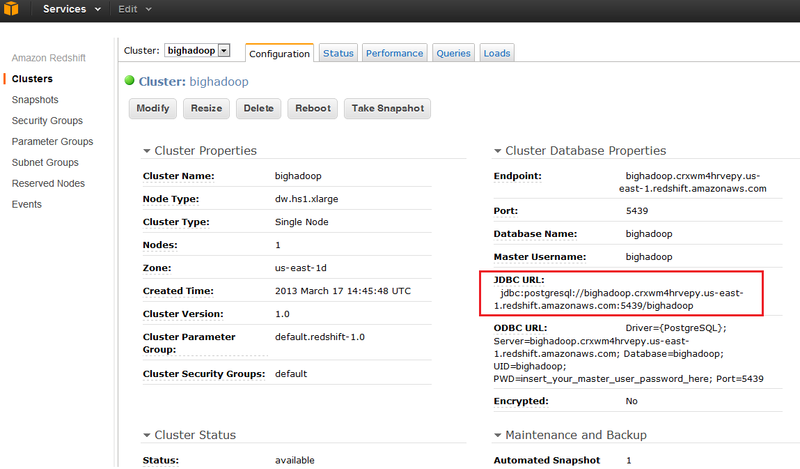 From then on the client can be connected to the Redshift cluster. We tested the service with Amazon stock prices downloaded from Yahoo Finance. 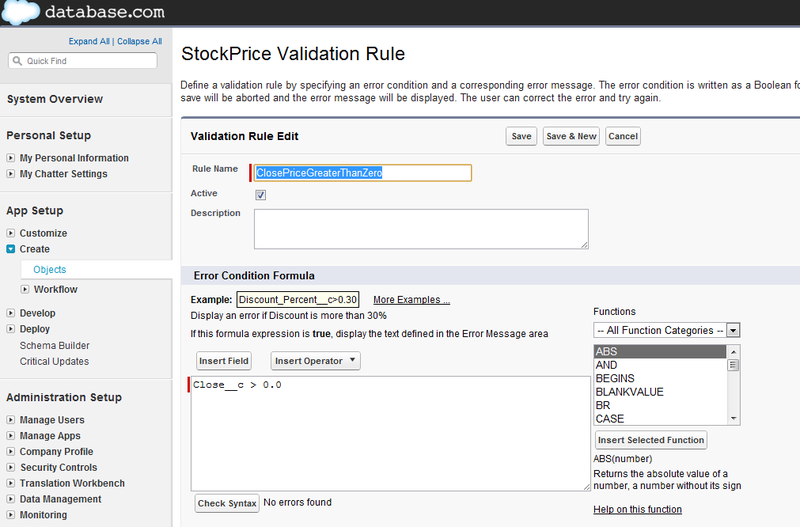 The content has been uploaded to a S3 bucket called stockprice (S3://stockprice/amzn.csv). We had to make it accessible for everyone to read. (open/download). 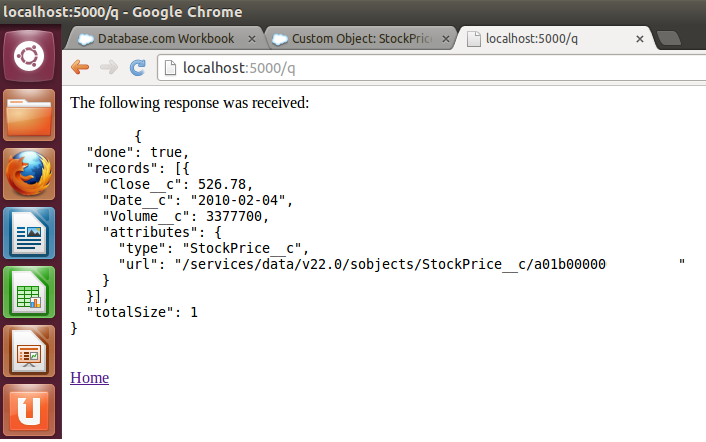 To load the data into stockprice table, we had to use copy command with the S3 source file (it could also be an Amazon DynamoDB source). If there is any error during the load operation, it can be verified by running a select statement on the stl_load_errors table. (e.g. incorrect data format). And then we can run our SQL statements to analyse the data. AWS console supports various management functions of the cluster, we can reboot the cluster, we can modify parameters, we can resize it by defining different node type (XL->8XL) or decreasing/increasing the number of nodes. 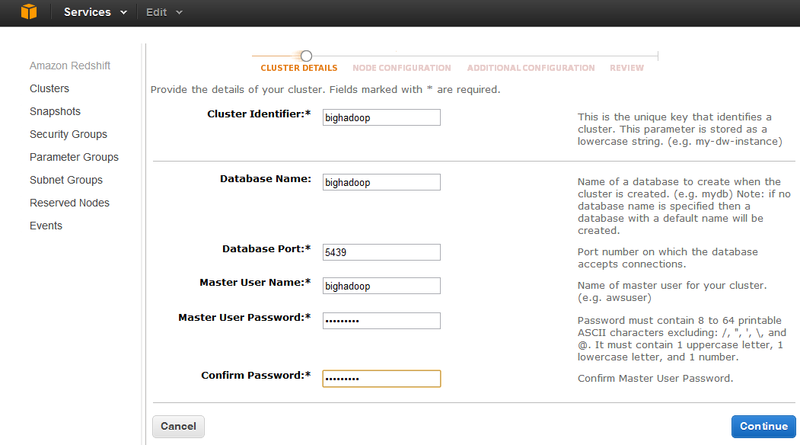 We can also delete the cluster via AWS console. Amazon Web Services Redshift is another big step to make cloud services available for enterprise computing. It offers a data warehouse capability with minimal effort to start up and scale as operations demand. It is a great complement to other database services such as DynamoDB for NoSQL requirements and RDS for relational database services. Microsoft and Hortonworks joined their forces to make Hadoop available on Windows Server for on-premise deployments as well as on Windows Azure to support big data in the cloud, too. 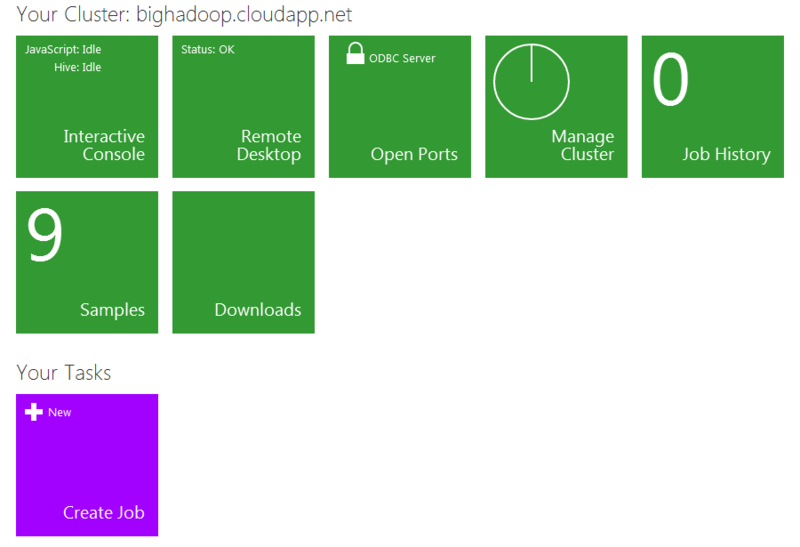 This post covers Windows Azure HDInsight (Hadoop on Azure, see https://www.hadooponazure.com) . As of writing, the service requires an invitation to participate in the CTP (Community Technology Preview) but the invitation process is very efficiently managed – after filling in the survey, I received the service access code within a couple of days. The first step is to request a new cluster, you need to define the cluster name and the credentials to be able to login to the headnode. 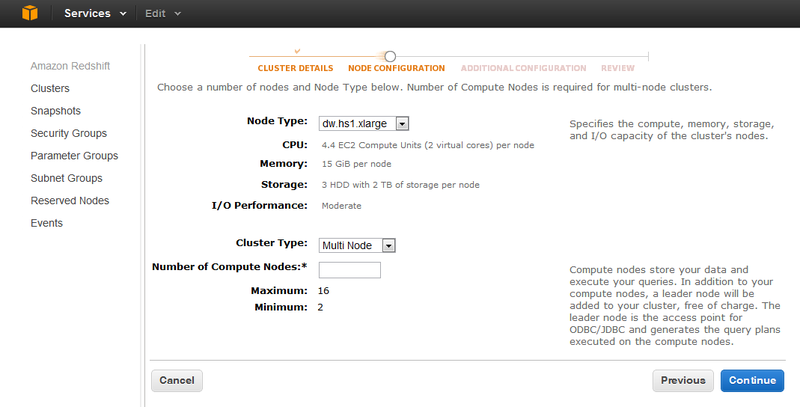 By default the cluster consists of 3 nodes. 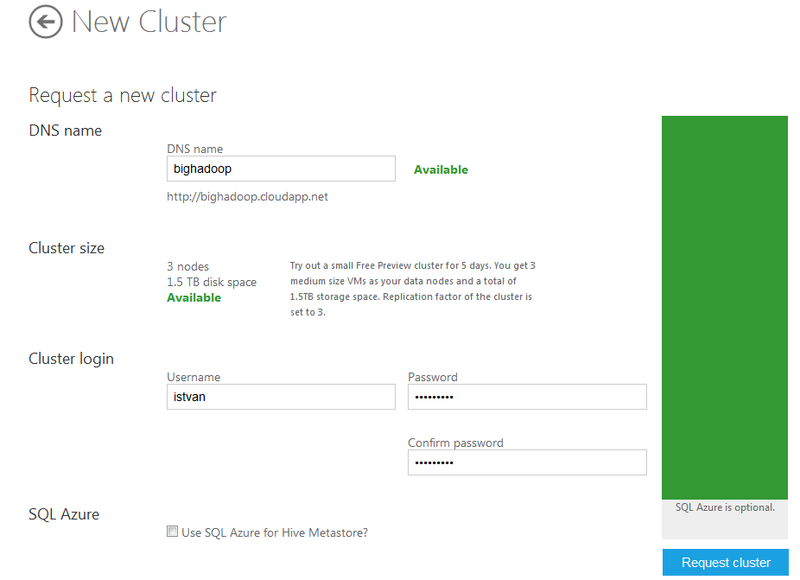 After a few minutes, you will have a running cluster, then click on the “Go to Cluster” link to navigate to the main page. No Hadoop test is complete without the standard WordCount application – Microsoft Azure HDInsight provides an example file (davinci.txt) and the Java jar file to run wordcount – the Hello World of Hadoop. The demo application for C# streaming is again a wordcount example using the imitation of Unix cat and wc commands. You could run the demo from the “Samples” tile but I prefer to demonstrate Hadoop Streaming from the command line to have a closer look at what is going on under the hood. In order to run Hadoop command line from Windows cmd prompt, you need to login to the HDInsight headnode using Remote Desktop. First you need to click on “Remote Desktop” tile, then login the remote node using the credentials you defined at cluster creation time. Once you logged in, click on Hadoop Coomand Line shortcut. c:> hadoop fs -get /example/apps/wc.exe . c:> hadoop fs -get /example/apps/cat.exe . c:\apps\dist\hadoop-1.1.0-SNAPSHOT> hadoop jar lib\hadoop-streaming.jar -input "/user/istvan/example/data/davinci" -output "/user/istvan/example/dataoutput" -mapper "..\..\jars\cat.exe" -reducer "..\..\jars\wc.exe" -file "c:\Apps\dist\wc.exe" -file "c:\Apps\dist\cat.exe"
Microsoft and Hortonworks have re-implemented the key binaries (namenode, jobtracker, secondarynamenode, datanode, tasktracker) as executables (exe files) and they are running as services in the background. The key ‘hadoop’ command – which is traditionally a bash script – is also re-implemented as hadoop.cmd. The distribution consists of Hadoop 1.1.0, Pig-0.9.3, Hive 0.9.0, Mahout 0.5 and Sqoop 1.4.2. Storm is written is Clojure and Java. One of the key concepts in the Storm is topology; in essence a Storm cluster executes a topology – topology defines the data sources, the processing tasks and the data flow between the nodes. Topology and MapReduce jobs in Hadoop can be considered analogous. Storm has a concept of streams which are basically a sequence of tuples, they represent the data that is being passed around the Storm nodes. There are two main components to manipulate stream data: spouts which are reading data from a source (e.g. a queue or an API, etc) and emit a list of fields. 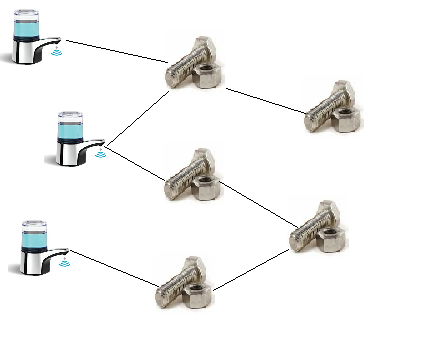 Bolts are consuming the data coming from input streams, processing them and then emit a new stream or store the data in a database. One important thing when you define a topology is determine how data will be passed around the nodes. As discussed above, a node (running either spouts our bolts) will emit a stream. Stream grouping functionality will allow to decide which node(s) will receive the emitted tuples. Storms has a number of grouping functions like shuffle grouping (sending streams to a randomly chosen bolt), fields grouping (it guarantees that a given set of fields is always sent to the same bolt), all grouping (the tuples are sent to all instances of the same bolt), direct grouping (the source determines which bolt receives the tuples) and you can implement your own custom grouping method, too. If you want to know more about Storm internals, you can download the code and find a great tutorial on github. 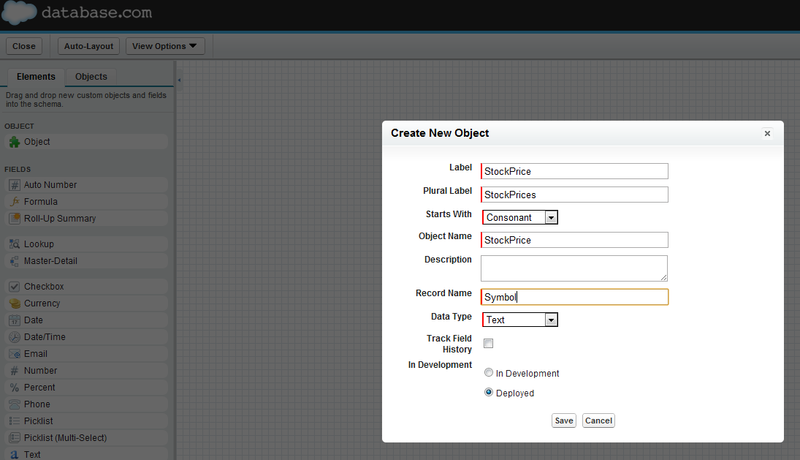 Alternatively, you can import the code as an existing maven project into Eclipse and run it from there. ( Import…-> Maven -> Existing Maven Projects ). * This topology demonstrates Storm's stream groupings and multilang capabilities. As a first step, Storm topology defines a RandomSentenceSpout. RandomSentenceSpout has a method called nextTuple() that is inherited from ISpout interface. 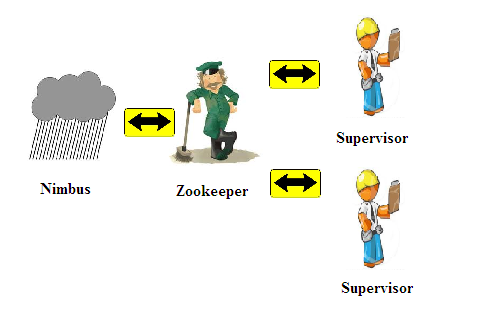 When this method is called, Storm is requesting that the Spout emit tuples to the output collector. In this case, the tuples will be randomly selected sentences from a predefined String array. Storm topology is using a shuffleGrouping() method to send the sentences to a random bolt referred as “split”. That method receives the words as tuples and uses a Map to count the number of the words. Then it will emit the result. The parallelism can be controller by various methods and arguments, like setNumWorker()s, setMaxTaskParallelism() and parallelism_hints argument in building the topology, see e.g. 5 in builder.setSpout() method. The parallelism_hint defines the number of tasks that should be assigned to execute the given spout. Each task will run on a thread in a process somwehere around the cluster. When we run the application, we can see that there are multiple threads running in parallel that are emitting the original random sentences, then another threads are splitting them into words and yet another threads are counting the words. Big Data analytics can come in many flavours; from batch processing to a-hoc analytics to real-time processing. Hadoop, the granddad of all big data is focused on batch-oriented solution – should you need to support real-time analytics, Storm can offer an interesting alternative.